Nouvelle Inc., an American-based compression wear company, seeks international distribution outlets for its newly-expanded line of quality post-surgical garments. Compression wear is used following cosmetic, plastic and reconstructive surgery to expedite healing and minimize scarring. Nouvelle maintains a meticulous approach to ensuring every stitch, every panel, and every aspect of each garment is sturdy, comfortable, and durable. We have sustained an unwavering commitment to ensuring the finest, most beautifully hand-crafted garments at competitive prices. Thanks to emerging markets throughout Europe and beyond, Nouvelle, Inc. is pleased to introduce its newly-expanded post-surgical compression wear line to a broader base of international distributors. Cosmetic and Reconstructive Surgery Patients. Compression garments are specially-designed elastic apparel worn after surgical procedures and throughout recovery. They provide additional support by contouring to the body or body part. Plastic surgeons generally recommend use of compression garments following tummy tucks (abdominoplasty), liposuction, arm lifts (brachioplasty), face lifts (rhytidectomy), facial procedures, gastric bypass procedures, male mastopexy (gynecomastia treatment), breast augmentation , breast reduction, and many other types of surgical sculpture procedures. Dermatologists also may recommend compression wear for patients with lymphoma, burns, and varicose veins to help improve quality of life. Individuals Shopping for Quality Shapewear. Purchases of medical-grade compression garments for body sculpting, shaping and slimming continue to increase. Many consider compression garments an effective tool for contouring the body without having plastic or cosmetic surgery. While compression garments are not an alternative to losing weight or improving health, they can have a slimming effect by subtly smoothing and sculpting the appearance of the body beneath clothing. Often, people considering compression garments for non-surgical use have recently lost a great deal of weight, and may have excessive body tissue folds or conditions such as gynecomastia (male breast enlargement). Compression garments offer a safe, non-surgical alternative to stabilizing and compressing excess body tissue and skin folds. Patients Seeking Scar Care Therapy. Nouvelle recently added internationally-recognized ScarHeal products to its catalog as part of an ongoing commitment to superior results following cosmetic, plastic and aesthetic procedures. As noted in a recent edition of Ladies Home Journal, ScarHeal products feature an outstanding combination of ingredients designed to help calm inflammation and tame overactive collagen production in scars resulting from surgery, burns, wounds, and keloids. The line features four proven products for treating scars resulting from any trauma to the skin. Additionally, they offer an innovative, non-surgical treatment for wrinkles. Featuring four-way stretch and memory, each garment can withstand numerous washes, endure extremely long wear times, and miraculously retain original shape and quality. All designs have been through rigorous testing and meticulous scrutiny to ensure complete comfort and enhanced efficacy of every angle, seam and compression area. Nouvelle designs have a reputation for beauty. The company uses only the finest fabric available, and hand-inspects each seam and stitch to ensure garments are soundly, solidly constructed. Nouvelle offers an endless assortment of surgical garments for every procedure, including abdominal girdles, binders, augmentation bras, and full body suits. The company also features a full line of 2nd stage garments for women and men of all shapes and sizes. All products are latex and formaldehyde-free and proudly manufactured in the USA. A seasoned design and manufacturing team is ready to create custom garments on a moment’s notice if a customer needs a specific item not typically available. Realizing post-operative healing stages can be uncomfortable, Nouvelle has paid particular attention to every conceivable way the fabric touches the skin. Stitches are constructed so they are perfectly flat, so as not to aggravate incisions. 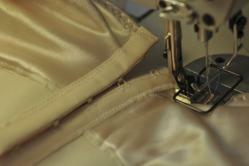 Zippers and hook and eye closures are never in danger of contacting the skin. Not a single design uses metal wires or stays. Nouvelle manufactures and distributes post-surgical compression wear, body shaping garments, and scar care products worldwide from its facility in Virginia Beach, Va. For more information about international distribution and sales, please contact Dawn Cover via email or telephone.